SIRT1 is one of the seven sirtuins found in mammals. SIRT1 has been found to play a pivotal role in ageing, inflammation, cancer, energy use, and other important functions central to health. Being able to reliably and specifically activate SIRT1 is expected to have wide-ranging health benefits. Accordingly, researchers and the pharmaceutical industry have been searching for small molecules that can activate SIRT1. Resveratrol, a polyphenol first extracted from grapes, was one of the first compounds discovered that appeared to activate SIRT1, although the mechanism whereby it did so was unclear. Other compounds similar in structure to resveratrol have also been reported to be able to activate SIRT1. Because inhibition of SIRT1 may be a useful therapy for some cancers, small molecules that can inhibit SIRT1 have also been actively sought. Kahyo et al. 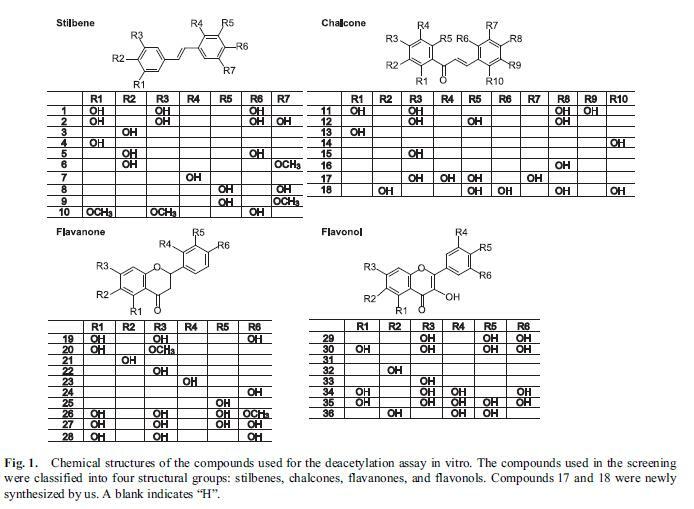 screened 36 different chalcone polyphenol compounds in an in vitro assay for SIRT1 activity. The assay directly measured the deacetylase activity of SIRT1 in the presence of the various compounds. A cell culture assay conducted in HEK293T cells (an immortalized human embryonic kidney cell line commonly grown in laboratories) was used to further explore the effect of the compounds in SIRT1. In the cell culture assays, the activity of SIRT1 in deacetylating p53 was measured in vitro in cell lysates from cells transfected with p53. The cells were also treated with the chalcone polyphenol compounds and the direct effects of the compounds on cell growth were measured. The various compounds tested by Kahyo et al. can be classified as stilbenes, chalcones, flavanones, and flavonols. Several known compounds, including resveratrol and pterostilbene, were included in the study. Other compounds were brand new and had been synthesized de novo for the experiment. Three of the compounds inhibited SIRT1 in vitro and were studied further. Of these three, only compound 17 was able to directly inhibit the deacetylation of p53 in the cell lysate assay. Compound 17 was applied to the HEK293T cells at a fairly low dose. It was able to inhibit the deacetylation of p53 in vivo, causing hyperacetylation of p53. The growth of the cells was inhibited by treatment with compound 17. In this study, several well-known compounds were included. Resveratrol is #1, piceatannol is #2, pterostilbene is #10, and quercetin is #30. The study is particularly interesting because it invented an entirely new assay for SIRT1 activation (the p53 deacetylation assay). The results of Kahyo et al.’s study found that compound #1 (resveratrol) only marginally activated SIRT1 in their new assay. Both piceatannol (#2) and pterostilbene (#10) activated SIRT1 to a much greater extent than did resveratrol. Quercetin, a flavanone, has long been suspected of being a SIRT1 activator; however, in this study, it was a potent in vitro inhibitor of SIRT1. Recently, studies into the mechanism whereby resveratrol activates SIRT1 have suggested that it might not directly activate it at all. Instead, it seems to simply enhance deacetylation of peptides that contain a Fluor de Lys modification, causing an apparent activation of SIRT1 as a side-effect of this activity. A Fluor de Lys modification is the attachment of a fluorescent molecule to the peptide. Piceatannol (#2) is a metabolite of resveratrol. It is possible that many of the beneficial effects clinically shown in response to taking resveratrol are due to the body’s breaking it down into piceatannol, which can then directly activate SIRT1. Resveratrol may also be acting through pathways other than SIRT1 in mediating some of its demonstrated beneficial effects. Pterostilbene (#10) is a stilbene similar in structure to resveratrol. In the most recent study, it directly activated SIRT1 to a much greater extent than did resveratrol (1.86 vs. 1.29, respectively, see chart above). Pterostibene is known to be more readily absorbed by the body and to have a much longer half-life in the body than resveratrol. 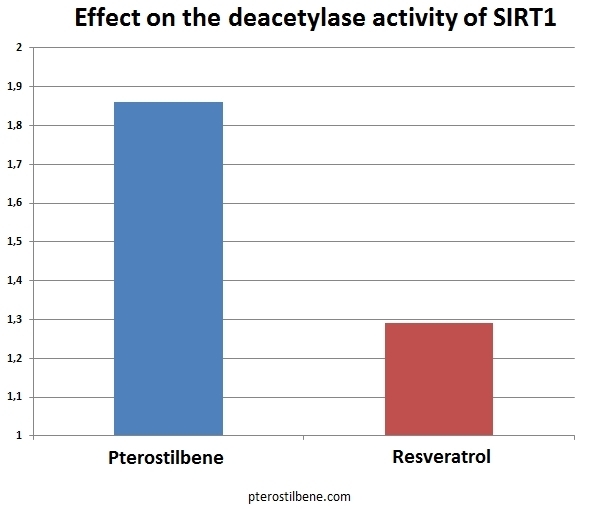 If pterostilbene has a greater ability to directly activate SIRT1, the combination of greater bioavailability plus greater activity could result in pterostilbene having an exponentially more potent in vivo effect on health. In addition to its effects on SIRT1, pterostilbene has been reported to be able to lower blood sugar as effectively as metaformin, reduce cholesterol levels, and to inhibit NF-kappaB, thereby blocking the inflammatory pathways. In the study by Kahyo et al., they explain that their assay for SIRT1 activation is a better-designed assay and should give more accurate results. In the older assays, quencher activity of the substrate could affect the results of the assay. In the new assay, the quencher and fluorophore are attached to opposite ends of the substrate, preventing substrate quencher activity from affecting the assay results. Previous findings that resveratrol and quercetin were potent activators of SIRT1 may be entirely due to activation of quencher activity in the older assays. Kahyo et al. were actively looking for agents that inhibited SIRT1, and therefore basically ignored their findings about the most potent activators of SIRT1. They identified four fairly potent activators of SIRT1: pterostilbene, piceatannol, and two previously unstudied compounds. Researchers interested in activating SIRT1 might want to turn their attention to these four compounds. Since piceatannol realized the best score (3.09), it is now interesting to make the comparison with pterostilbene. Pterostilbene and piceatannol: which one to choose? Studies of phenol group containing stilbene molecules such as piceatannol and resveratrol suggest that they are rapidly cleared from the body via the liver. In the liver they are extensively glucuronidated (2)(3)(4). Shortly after intravenous infusion, glucuronic acid forms are the predominant species found in both plasma and urine as it has been verified by in vivo mass spectrometry studies in humans. Once this type of stilbene has been glucuronidated and sulfationed in the liver and the intestine, it is rapidly excreted. Most of the excretion appears to be through the biliary ducts, with some minor clearance via the urine. It is reasonable to conclude that the bioavailability of stilbene molecules is indirectly proportional to their rate of hepatic removal. Piceatannol, pinosylivn, and rhapontigenen all appear to be cleared from the body at a maximal rate that depends solely on the time it takes them to travel through the bloodstream to the liver. This suggests that they have very limited bioavailability and have an extremely short half-life in the body (2) which makes them not interesting to take as dietary supplement. 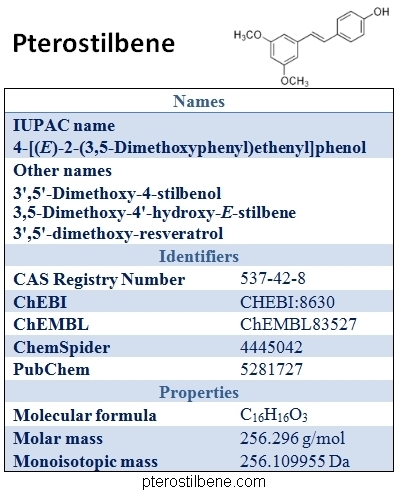 On the other hand, stilbenes that have replaced the phenol functional groups with methoxy groups, such as pterostilbene, cannot be extensively glucuronidated (2). These stilbenes demonstrate completely different pharmokinetics and are not rapidly cleared from the body after either oral administration or intravenous infusion (5)(6). They have a long half-life and can reach therapeutic levels within the body after once or twice daily oral administration. In the case of pterostilbene, we can activate SIRT1 better than resveratrol does and longer than piceatannol which clearly make it the best choice to take as a dietary supplement.